Symone Abbott leaps for a spike. 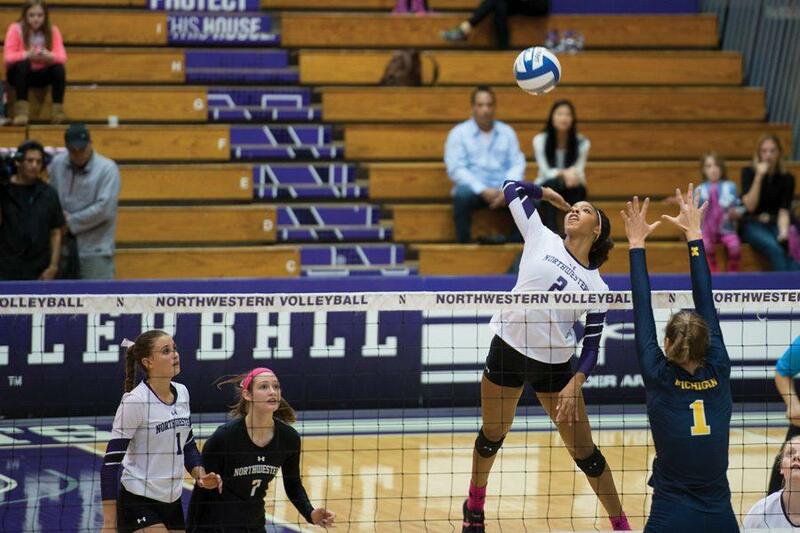 The junior outside hitter will look to lead Northwestern to its first Big Ten victory this weekend. Northwestern is quickly moving into must-win territory. With a six game stretch looming against ranked Big Ten teams, including the No. 1, No. 3 and No. 4 teams in the country, the Wildcats (7-13, 0-8 Big Ten) need a momentum shift this weekend. NU takes on No. 24 Purdue (12-7, 2-6) on Friday and Indiana (13-8, 2-6) on Sunday. Coach Shane Davis made some lineup changes in the third and final set last Saturday against Illinois and they seemed to pay off: The Cats scored 22 points, more than they had in a set in five matches. Davis inserted three freshmen — Sarah Johnson, Allie Lindroth and Emily Ehman — into the lineup. Lindroth had four kills, while Ehman had four digs. Davis and junior outside hitter Symone Abbott were particularly bullish on Ehman’s play against the Fighting Illini. But NU is dealing with libero trouble. Sophomore Katie Kniep started the season as the squad’s libero, but has been out since Oct. 1 with a back injury. Senior outside hitter Rafae Strobos had been playing libero until she was replaced by Johnson in the third set against Illinois. Davis would not say who he plans to start against the Boilermakers. Hazen said the team was excited with the way the freshmen played Saturday. Davis said Lindroth, Johnson and Ehman will definitely see some playing time this weekend. He’ll have to decide whether to start Lindroth or stick with senior outside hitter Kayla Morin. The Cats could have success against the Hoosiers. NU last won a set since when it played Indiana back on Sept. 21 in Bloomington. Abbott said the team definitely sees the game as an opportunity. Although the Cats are still looking for their first Big Ten win, Hazen said they’re excited about their chances.